I wrote about our old bread maker a while ago, and it seems that it had made its last loaves. I tried to make a couple more in it, and they came out rather brick like. It seems the belt or motor was so worn that it couldn’t knead the dough properly after the first rise, meaning that the bread wasn’t rising properly at all, and we were getting rather solid half-sized loaves. So we’ve bitten the proverbial, and bought a new one. It’s the same make as our last one, but a slightly better model. It has an ingredient dispenser, which means you don’t have to stand around and wait to add extra ingredients, the machine will do it for you. We make quite a few fruit loaves, so this is a bonus. It’s only just arrived, and hasn’t yet made its first loaf (it’s doing that as I type), so there’ll be another update once we’ve tried it for a bit. 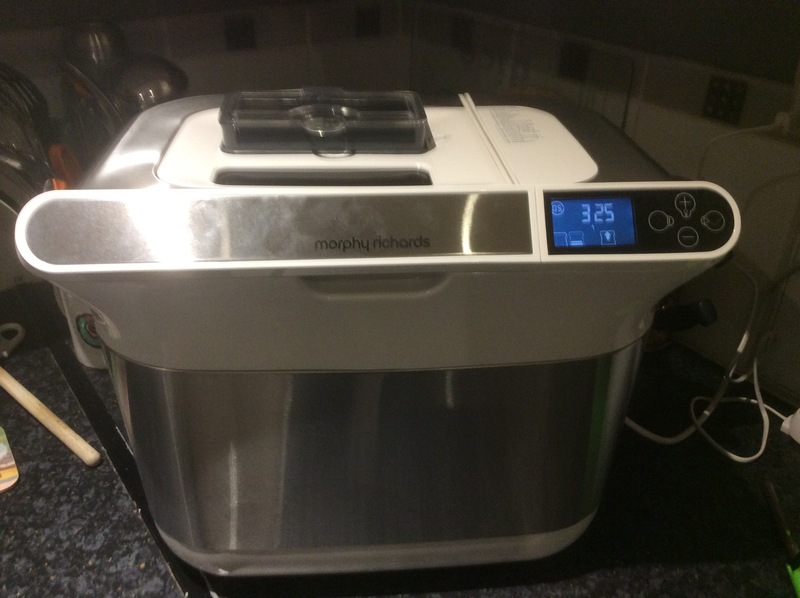 This entry was posted in Cooking and tagged bread, bread making, breadmaker. Bookmark the permalink. Oh, very nice, Alan. I like banana bread, so let me know when you have it ready and I’ll send you my mailing address! LOL!